When you search the keyword “Ayutthaya” in Google, the image results will show you a lot of beautiful temple sites. But where are these Ayutthaya’s most instagram temples located? Today I will introduce you guys these Ayutthaya’s most instagram temples. Let’s discover 7 Ayutthaya’s most instagram temples with me right now. This temple is also a part of Ayutthaya Historical Park and it is one of the best known Ayutthaya’s most instagram temples. What makes Wat Chaiwatthanaram so special is its architecture; the temple is built in symmetry. This shows how this temple was planned out perfectly before it was built. Therefore, it was defined as a UNESCO World Heritage Site in 1991 and remained important to Thai people until now. Reposting @boundless_inspiration:⠀ …⠀ "Wat phra mahathat – Ayutthaya. Was once a core of Ayutthaya city, and it was destroyed when the city was taken by the Burmese. Although, there are traces left over and has become a historical temple. "⠀ ⠀ #takemetour #localexperience #awesome_photographers #amazingthailand #thailandluxe #watchthisinstagood #roamtheplanet #ig_worldphoto #ig_exquisite #igrepresent #beautifuldestinations #guardiantravelsnaps #vacationwolf #ig_serenity #ig_photostars #viajar #awesomepix #localexpert #worldtravelpics #beautifulplaces #staydifferent #letsgosomewhere #doyoutravel #travelpicsdaily #Ayutthaya #thailand?? When you search “Ayutthaya” in Google, certainly this photo of Buddha head in the tree will pop up because it is also one of Ayutthaya’s most instagram temples. If you make a visit to Wat Mahathat, you have to make a visit to see this specular head of a stone Buddha image within the roots of a tree. Furthermore, Wat Mahathat is also the center of Buddhism in Ayutthaya Kingdom; this, many royal ceremonies are hold here. Nice capture by @hetoooo⠀ .⠀ #takemetour #localexperience #amazingthailand #thailandluxe #globe_travel #youmustsee #global_stars #earthfocus #roamtheplanet #ig_exquisite #ig_dynamic #wonderful_places #bestdiscovery #forbestravelguide #worlderlust #ig_europe #ig_today #awesomeearth #theimaged #nakedplanet #createcommune #viajar #topdecker #worldtravelpics #ayutthaya #verythai #thailand?? Wat Yai Chai Mongkhon is one of the most important temple of Thai history. Thus, it is also one of the most visit temple by tourists and considered as one of Ayutthaya’s most instagram temples. The architecture here is indeed very unique. The pagoda of Wat Yai Chai Mongkhon is one of Ayutthaya’s landmarks, as it is named as the tallest pagoda in this province. 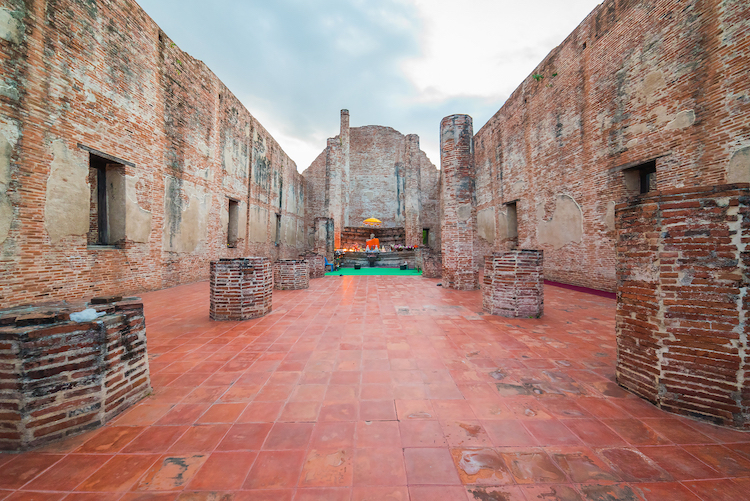 After you stepped out of this site, you will surely gain more insights of Ayutthaya history. You should not miss Ayutthaya when visiting Thailand. Our #LocalExperts can guide you through this beautiful city!.⠀#takemetour #localexperience #awesome_photographers #amazingthailand #thailandluxe #watchthisinstagood #roamtheplanet #ig_worldphoto #ig_exquisite #igrepresent #beautifuldestinations #guardiantravelsnaps #vacationwolf #ig_serenity #ig_photostars #viajar #awesomepix #localexpert #worldtravelpics #beautifulplaces #staydifferent #letsgosomewhere #doyoutravel #travelpicsdaily #Ayutthaya #thailand?? As a part of Ayutthaya Historical Park, this old temple is one of Ayutthaya’s most instagram temples. If you come here, one of the must-see site is the Biggest Buddha in the world. The 39 meters high Buddha, which is known in Thai as Luang Pho Tho Buddha statue, stands tall in the center of this temple. Come here and see how glorious this Buddha statue is with your own eyes! This temple is mainly a massive temple ruin but it is worth a visit to see what is left behind and also to learn more about Ayutthaya history. In addition, Wat Lokayasutharam’s unique characteristic is its impressive 42 meters long reclining Buddha, which was built since Ayuthaya time. 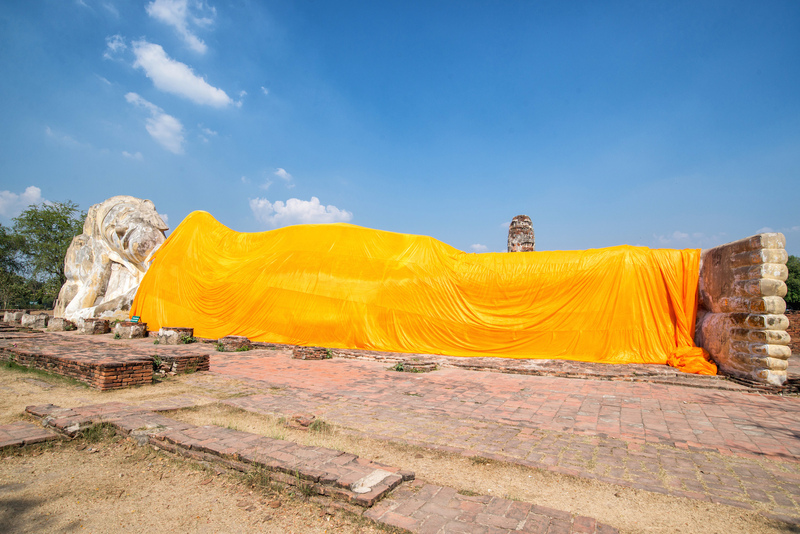 The reclining Buddha is wrapped up in bright orange cloth. Thai people usually come here to make offerings or to cover the Buddha sculpture with gold leaves. Wat Phra Si Sanphet is also located within Ayutthaya’s World Heritage Park. This is one of the most important temple of Ayutthaya and Ayutthaya’s most instagram temple. It served as a model of the Temple of the Emerald Buddha in Bangkok. What makes this temple unique is that it is actually a Royal temple, meaning that during the past, it was only used by kings of Ayutthaya kingdom. If you are looking for a great temple to meditate, then coming to Wat Maheyong is the best choice. This temple is famous for Buddhist followers to come here and gain their peace stages through meditation. Wat Maheyong consists of a large ordination hall with Buddha images at the center, a main chedi, and other smaller chedi as well. Head up for you guys, it is actually more easier to travel in Ayutthaya if you have a private car as you can save more time on the road, which will allow more time for you to spend at each temple. And to see Ayutthaya like a local, I would recommend you to go with the local experts. Just click on the links below to discover more of the unique tours I had chosen for you guys. 1.Amazing Ayutthaya! Check out The Old Vibe of Thailand! In conclusion, you already know what are so special about these temples. Ayutthaya is calling for you; let’s go!